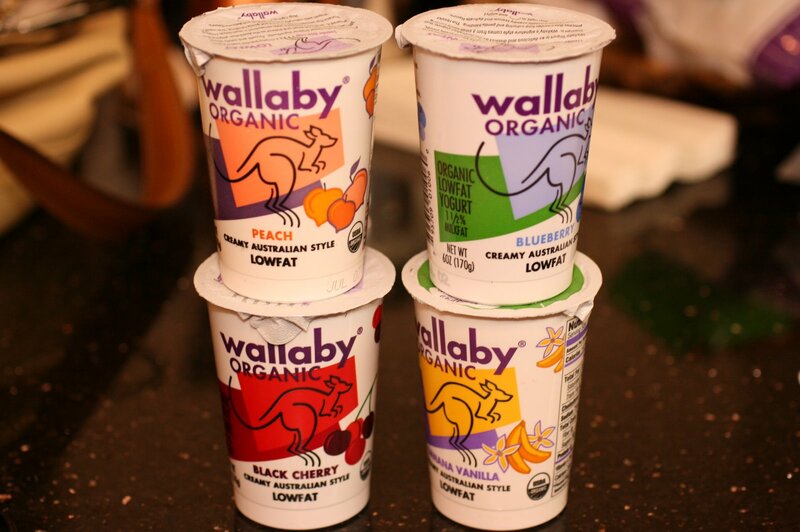 I was replenishing my stock of Fage 2% (Greek strained yogurt) today and noticed Wallaby Organic Yogurt on sale. There’s so many new yogurts around, a good thing since our standard American brands don’t cut it for me, and since I tried Siggi’s Skyr (Icelandic style yogurt) last time, I figured I should give this Australian style yogurt a try as well. I bought 4 flavors from their Organic lowfat line (I’m not into nonfat yogurt, you just need a little fat) and they were delicious. The flavors were very natural, which makes sense if you look at the clean ingredient list, and of course, organic is a plus. These yogurts are not as thick as Fage but certainly creamy with great mouth feel. They are less filling so they work as quick and healthy snacks. I do whole heartedly recommend them, at least the two flavors I’ve tried so far, Blueberry (like a smoothie) and Banana Vanilla (nice and light). posted by jessica	at 08:54 PM	Filed under Products. You can follow any responses to this entry through the RSS 2.0 feed. Both comments and pings are currently closed. I’m always so jealous of your yogurt postings. We only have American yogurt here. Every time I make tzatziki I think of Greek yogurt. Have you ever had Nancy’s yogurt? It’s the only kind I like around here (Oregon company), and the honey yogurt is actually pretty darn good. For Dr. Food…see if you can find Stonyfield Farm organic plain yogurt. While it isn’t quite as thick as Greek yogurt it has the same tart flavor and is much thicker and richer than the watery stuff that passes as “yogurt” in most of the US. And I can find it in the grocery store in Mississippi, so I’m imagining it’s pretty widely available. MJ–You’re right! I forgot to mention my other favorite! Stonyfield is great stuff, and doesn’t taste anything like the generic Dannon type I’m used to seeing so regularly! Thanks! Dr. Food, I haven’t seen Nancy’s but I’ll look for it next time. It may be worth shipping yourself a case of Fage Greek yogurt. It lasts for a good amount of time. mj, thanks for visiting! I use the plain Stonyfield for baking sometimes.